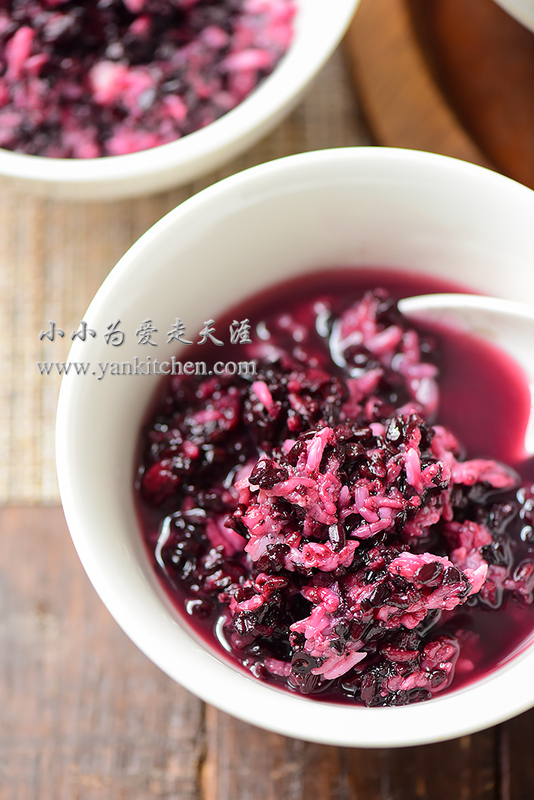 It is a very traditional and common for Chinese people to make sweet rice wine at home. But it is not really the clear-colored high alcohol content version of “rice wine” you are thinking. It is non-distilled, very sweet, and more dessert like. The most common one is made with pure white sweet rice. Sometime people add different ingredients to make variations too. This time I add black sweet rice. After fermentation, it becomes a gorgeous deep purple color. Sweet rice absorbs less water than regular white rice. 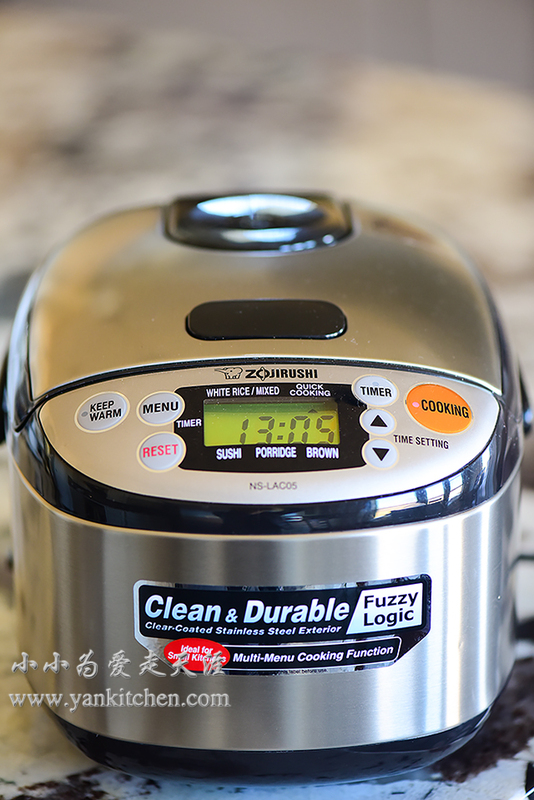 So use a little bit less water when cooking sweet rice. And I use “quick” setting. The reason I cook two kinds of sweet rice separately is that I want them to keep their own colors. Wait for two different rice to be cooked and cooled down; add them to a large bowl; and mix gently with a spatula. 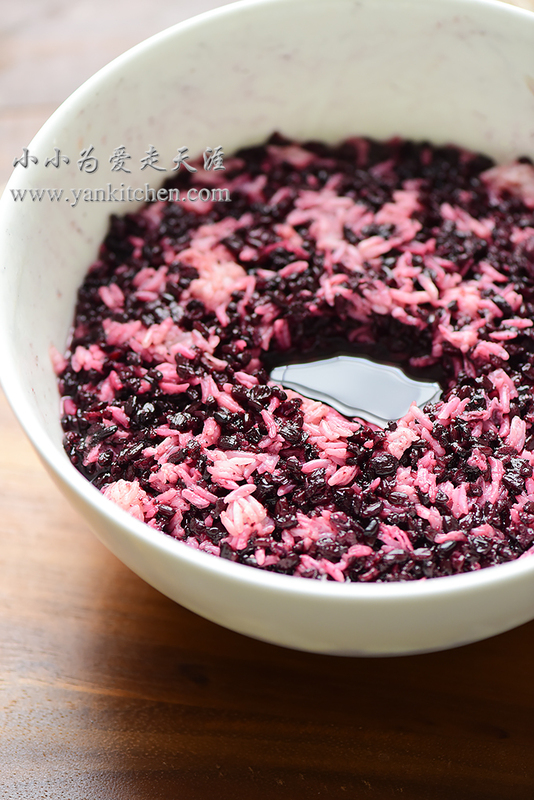 Sweet rice can be very sticky when cooled down. That is where cold boiled water comes in. Rice wine starter/yeast is very popular and common in Asian countries. You should be able to buy it from any Asian grocery stores. They are usually sold in a small plastic package which contains two round rice yeast balls. Smash and grind them into fine white powder before adding them to sweet rice. 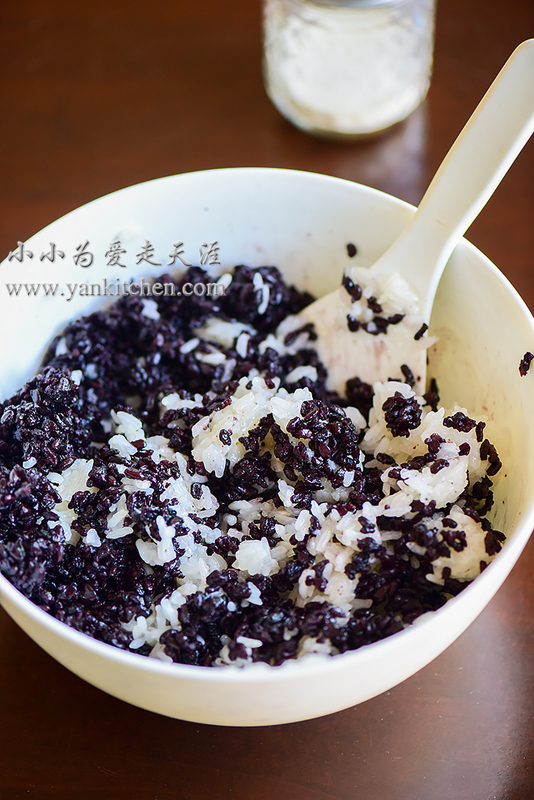 Sprinkle sweet rice mixture with rice wine starter/ yeast powder. Gently mix everything together again. Pat the rice flat, leaving a one-inch hole in the center. The hole is totally operational. You don’t have to do it. It is just a lot easier to observe how much rice wine coming out the rice through that hole in the center. Cover with lid or plastic wrap. Store it in warm dry place for 2 to 3 days. At the end of fermentation time, you can test if sweet rice wine is ready or not by its taste. Sweetness is how we tell. The sweeter, the better. If you get blank taste, just put it back, wait for another day, and taste again. Sweet rice wine can be served immediately when it is completely fermented, and yes, both liquid and the rice part. My favorite way is to refrigerate it overnight and serve it cold. In my hometown, people used to make pickle vegetables with sweet rice wine in old times. But fewer and fewer families are still doing so. Vinegar is quicker and less labor intensive. Sweet rice wine can be served cold and hot. Cooking it with sweet rice cake balls is another classic way to enjoy it.